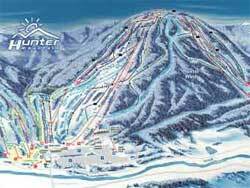 On Wednesday, January 18, 2012, at 8:50 AM, a Hunter Mountain employee named Brian Mattice of Gilboa, age 41, slipped and fell 200'. He was wearing safety equipment, including, but not limited to a helmet and cramp-ons. He slipped or tripped and fell onto his pants. Being slippery, he started to slide down a steep embankment. While sliding down the embankment he struck a tree and rock. This caused massive head trama. He was pronounced dead at the location where he fell to by the Greene County Corner. He was transferred to Albany Medical Center where an autopsy will be performed. When the accident happen, the Hunter Mountain Ski Patrol (EMS) responded to the accident scene on Milky Way Trail , but he found deceased. The Milky Way trail is located to the LEFT of the main chair lift. This trail does run down to the "F" lift. The ski run, K27 is to the left of the Milky Way Run, and Lower Cross-Over Run is to the right. Both Cramp-ons and Microspikes provide an enormous amount of traction on hard-packed snow and ice. But, if you slip and fall, your clothing becomes like a sled and will cause you to accelerate out of control. This appears to be what happen to Brian Mattice. Unless you have something you can use to dig into the snow to self-arrest, you are likely to have a serious or fatal accident. Unfortunately, you cannot dig your feet in because it will cause you to flip-over endlessly out of control. A truly sad story. My condolences go to his family and friends. Very sad outcome. The snow is rock hard with many places that are iced over. Need to be careful out there. It was very icy this past year. Lots of rock hard ice. Quite a few cramp-on accidents too. Some were very experienced. Sounds more like an unfortunate accident. Feel bad for the family, but sometimes life isn't fair. I suppose OSHA felt that he could have self-arrested. But, we know that other experinced hikers this past winter were unable to self-arrest. If the terrain is steep enough, you just cannot get self-arrested before picking up too much speed.